Hello there today is Vicky’s Happy Birthday!! I will be very short with this post as this is a scheduled one and by the time you read it I will hopefully be enjoying the last day of a Summer break in sunny Greece. I will update you very soon but for now let's concentrate on the card I made for sweet Vicky!! Vicky's favourite colour is Pink and the card I made her has plenty of that. the combo I settled on is River Rock, Pretty In pink and Basic Gray. I have used the Big Shot big time on this card. I have used the Fun Flowers bigz die and the little sizzlet called little leaves. 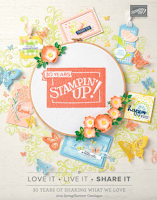 I have also used the Medallion background and the Curly Cute stamp set for the sentiment. I topped a button with pearls for a lovely centrepiece for the flower and a few more lines of pearls were used as decorations. I have also used some Melon mambo dsp for the flowers to add a extra splash of colour. hope you liked your card Vicky enjoy your special day. the more i see the medallion the more i need it! Happy Holidays! I loved my card, it's just stunning!! This card is just gorgeous!!! I will be featuring this card on My Crafty Picks #31 with a link back to your blog on 8-28-11. Make sure to stop by on Sunday to check out all the picks and to pick up your Blog Badge for being featured! !